Abbasi Nargesi, F., Azari Khosroshahi, R., Parvini Ahmadi, N. (2012). The Effect of Impurity of Inert Atmosphere on Synthesis of Nanostructure TiAl (γ) Alloy by Mechanical Alloying Process. International Journal of Nanoscience and Nanotechnology, 8(2), 63-70. F. Abbasi Nargesi; R. Azari Khosroshahi Azari Khosroshahi; N. Parvini Ahmadi. "The Effect of Impurity of Inert Atmosphere on Synthesis of Nanostructure TiAl (γ) Alloy by Mechanical Alloying Process". 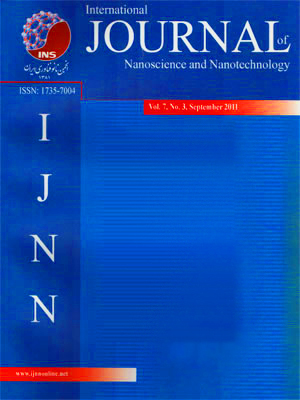 International Journal of Nanoscience and Nanotechnology, 8, 2, 2012, 63-70. Abbasi Nargesi, F., Azari Khosroshahi, R., Parvini Ahmadi, N. (2012). 'The Effect of Impurity of Inert Atmosphere on Synthesis of Nanostructure TiAl (γ) Alloy by Mechanical Alloying Process', International Journal of Nanoscience and Nanotechnology, 8(2), pp. 63-70. Abbasi Nargesi, F., Azari Khosroshahi, R., Parvini Ahmadi, N. The Effect of Impurity of Inert Atmosphere on Synthesis of Nanostructure TiAl (γ) Alloy by Mechanical Alloying Process. International Journal of Nanoscience and Nanotechnology, 2012; 8(2): 63-70. In this research, the high-energy planetary mill was employed to produce nanocrystalline Ti-50Al(γ)(at%) powders. Initial powders were mechanically alloyed in 99.9999% and 90% purities of Argon and also Air atmosphere with alloying times up to 50h. The effect of impurity of Argon atmosphere on the microstructure and the rate of phase transformation of Ti-50Al were investigated during mechanical alloying and after annealing at 1000°c. The results showed that the formation of nanostructure TiAl(γ) phase had directly related to the impurities of atmosphere in vials. The impurity of the atmosphere could delay the rate of amoprphization during mechanical alloying and decrease the rate of mechanical alloying process beside some unwanted phases which were produced in powder mixture. The powder particles produced in the high purity Argon atmosphere seemed to be finer than those in the atmosphere. The X-ray patterns, SEM analysis, changes in grain size and DTA test were studied during mechanical alloying and after annealing.